When it comes to researching diet and nutrition online, there are a whole heap of weight loss myths that can often make things confusing. Whilst the many benefits of losing weight are well-touted online, the best and safest weight loss practices are all too often, shrouded in mystery and poor explanation. Changing your lifestyle to facilitate your weight loss goal is hard enough. So you’ll need to go into the process with a calm, well-informed mind-set. It’s really important to know when to separate weight loss fact from fiction, so you can make greater progress in your health and fitness journey and lose weight safely. Your body treats calories the same, no matter what time you intake them. However, sneaking off to raid the fridge at midnight isn’t good for you because it can spike your blood sugar levels and interfere with your sleep pattern right before you should be winding down. A 2003 study from scientists at Oregon Health & Science University analysed the eating times and habits of 47 female monkeys and discovered no link between when they ate and whether their weight was affected. Pound for pound, muscle and fat actually weigh the exact same! The idea that one is heavier than the other is one of the most commonly believed weight loss myths! If you have a BMI of 28 or over, a doctor-prescribed weight loss pill like Orlistat [link to product page] can help you lose weight safely. Orlistat works best when incorporated into a balanced diet and regular exercise routine and can be purchased in 28 or 84 day courses. You may have heard that low-carb diets (such as the Atkins Diet) are a great way to lose weight quickly, but the truth is they can put your body under extra stress as they can be high in fat and salt. Cutting out pasta, bread and rice isn’t recommended as carbohydrates are an important source of energy and low-carbohydrate diets can cause negative side effects such as bad breath, headaches and constipation. Losing weight should be a slow and steady process. If you’re overweight, aim to lose around 5-10% of your starting weight by shedding 1-2lbs a week. The NHS recommends that the best way to achieve this is to eat around 500 to 600 fewer calories than you need a day. 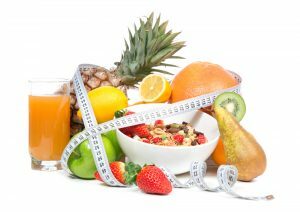 Weight loss myths surrounding detoxing have been around for a while. A detox is based on the idea that poisonous toxins build up in the body and can be broken down by simply modifying your diet. However, your body is adept at cleansing itself from anything that shouldn’t be there and detoxing can be dangerous because all too often it simply means severely limiting your caloric intake. When done for a long time, this can put pressure on your heart and leave you feeling weak and dizzy. Some detoxes are similar to fasting in that there is hardly any nutritional benefit at all. Never start a fast or a detox without first consulting your doctor. If you’re not used to exercise, you should build up to it. The amount of weekly moderate-intensity aerobic physical activity that is recommended for adults aged 19 to 64 is 150 minutes, but don’t do all this at once! Moderate activity is anything that can raise your heart rate and make you breathe faster and feel warmer. If you’re finding it difficult to shift excess weight and your BMI is 28 or above, talk to a doctor at Lloyds Online Pharmacy for a weight loss pill consultation. Eight surprising health benefits to having sexSearching your symptoms - are you a Cyberchondriac?